I’ve just read about a great idea that I haven’t seen before. It’s from the book Scenic Modelling by John de Frayssinet and if you haven’t got this book I really recommend it to any model or diorama makers. Basically, if you’re making a forest buying or making individual trees isn’t viable. It would cost a fortune. 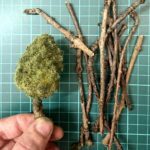 John’s tip, which he calls Meringue Forest in Scenic Modelling is to create the canopy of the forest en masse from expanding foam instead of using individual trees. 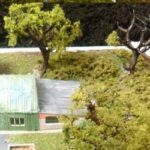 Here’s a summarised version of the tip, a modified version of which I used to create the above N scale forest on my layout. Essentially, build up an artificial ground layer at just below treetop height for the area of the forest you’re creating. Then get a tube of expanding foam — available from DIY and builders shops — and place lots of little blobs of the stuff across the area you’ve just made. (Expanding foam can be highly toxic. Please read and follow the instructions). My work in progress expanded foam before painting & foliage (static grass) is added. Being expanding foam, these blobs will grow and swell a bit and create a bobbled (frog spawn) surface over the area required. (It can take some time for the foam to finish expanding so give it time, several days if necessary). Once dry, paint it dark green and apply a coating of SprayMount adhesive spray and then sprinkle short dark green static grass over this. John recommends Woodland Scenics coarse turn-medium green. While this is drying, place two or maybe three rows of normal model trees at the front of the expanding foam forest so tree trunks are visible from the front. Next, John suggests making some small blobs of expanding foam, spraying them with SprayMount, and dipping them into a tub of static grass before letting dry. Once ready tease these into the tops of the real trees and between the expanding foam treetops. You could also apply the grass with a static grass applicator. Finally, lightly spray the top canopy with different shades of acrylic green paint to simulate the colour variation of natural forests. It’s a great tip for cheaply and quickly creating dense tree growth and forested areas. As mentioned above, I used a slightly modified version of this for N scale. Tree foliage for this scale is difficult to reproduce, and instead of static grass, I used Woodland Scenics Olive Green bushes (FC144)* with PVA over the top of the expanding foam. As a further tip (and for all scales – OO, HO etc), I swap out the rows of trees at the front that John suggests with garden Twiggs poked into the canopy and which reach down to the ground. These Twiggs being the tree trunks at the front of the forest. It saves on the cost of trees. I also paint or spray the front facing inner surfaces of the expanded foam a dark colour so the white doesn’t show through and ruin the look. I’m pleased with the result that would have cost a fortune in trees and the time to assemble them in closely packed formation. For the full details of this technique and lots of other tips get a copy of Scenic Modelling by John de Frayssinet. Update: since writing this I’ve found a technique to make my own scatter clumps material and use this instead. Always a real treat to be here with your tips – also, though I’m probably the last person in Britain to do so, I want to wish you a wonderful new year! Warmest wishes from Chris and Pauline. I found a better way with blending upholstry foam and different dyes in a blender.